State Representative Kim Rose (D-Milford) is pleased to support the American Lung Association and their Lung Force Campaign, which includes a number of different activities for the public to help raise lung cancer awareness, the No. 1 cancer killer of women in the United States. The Lung Force Campaign will be launching the Women’ Lung Health Week, the second week of May, from the 11th-15th. As part of the official ceremonies, on Tuesday, Milford Mayor Ben Blake issued and presented a city proclamation at City Hall to officially recognize this week and the efforts of the organization. Many activities are planned including wearing turquoise to work, the campaign’s signature color, during the designated week and sharing personal stories with the organization on their website http://www.lungforce.org/share-your-story. Other activities will include lighting buildings and landmarks in turquoise and an organization gala to promote the message. For more information please visit http://go.lungne.org/tapas. Thank you Kim for promoting this very serious issue and bringing attention to cancer awareness. A thank you to Mayor Blake as well who issued the proclamation for Lung Cancer Awareness month. To keep up to date on all news and information from Kim’s office, you drop a “Like” on her Facebook page here. For her official website please click here. 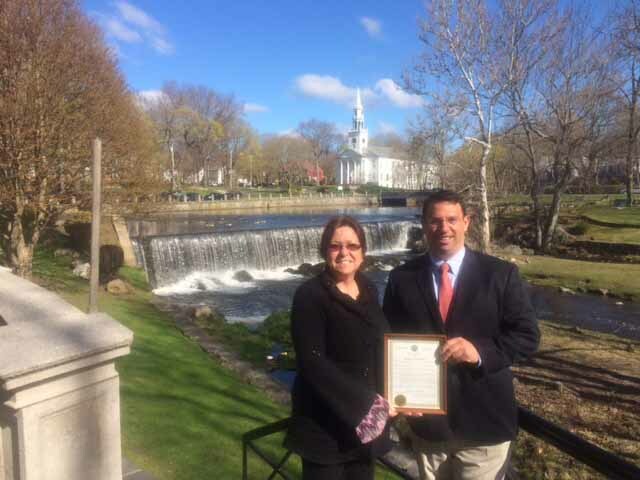 This entry was posted in News and Events and tagged Ben Blake, Cancer Awareness, Connecticut., Kim Rose, Lung Cancer Awareness Month, Milford, Press Release, State Rep Rose. Bookmark the permalink.